Are you a true Undertale fan? This is a quiz to test you knowledge on the indie game Undertale! With a 10 question quiz, we will DETERMINE how well you know it, whether you're on PC or console. I made this quiz because i really like the game, and I would like to know if people still remember these joyous journeys from when Undertale became a big hit in 2015! What is the first monster you encounter? Monsters? since when have monsters come into this game? How many spares does it take for Toriel to let you exit the ruins? how many phases does papyrus have on his genocide route? What does the screen say when you die? And who says it? Asgore says "[your name] Stay determined!" Toriel says,"Its okay child, we can have pie in heaven!" 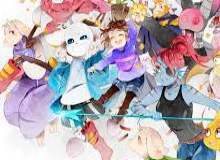 Sans says,"Ill never forget you! wait whats your name again?" Papyrus says," I still believe in you!" What is the last boss in pacifist route? Who has the theme song called, Megalovania? Which boss turns your SOUL purple? What is the date that you can battle the secret boss, So Sorry? You can battle him anytime. What is the fiery guy's name that you meet in Hotland? Quiz topic: Am I a true Undertale fan?